#210 Maple Street. 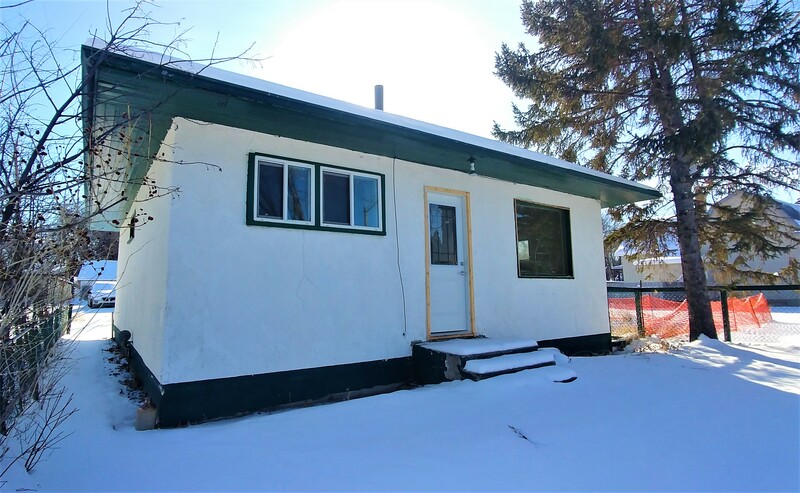 Maple Creek, SK- SOLD! Located on the north end of the Cypress Mobile Home Park, Maple Creek. Just 20 minutes from the Cypress Hills and an hr from Medicine Hat. Cypress Mobile home park is a well developed Park with many seniors as well as families that enjoy the quiet of a small community. This home has been recently moved to the park and has an attached deck in place. A spacious kitchen with sliding doors allow for good light in the kitchen table area. There is a large living room plus 2 smaller bedrooms and 4 pc bath. The master bedroom has a private door directly from the master bedroom to the 4 pc bath. Lot Rent $400 and includes taxes/water/sewer/garbage. Seller is park owner and is open to offers but will only consider offers that will have the home remain in the park. For further information or to arrange to see this affordable home contact the listing Realtor or Brokerage. 80 4th st. Fox Valley, SK. - SOLD! 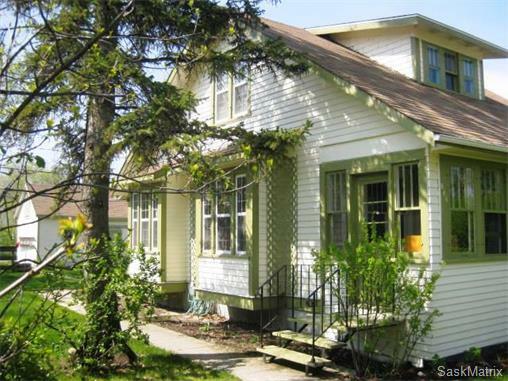 If you are looking for an affordable home in a quaint little Saskatchewan town, take a look at this home in Fox Valley. This home has a large eat in kitchen with good wood cabinets. The living room has wall to wall carpet and plenty of natural light. There are 3 main floor bedrooms all with closet storage. There is a good size 4 pc bath and a porch entry. The basement is mechanical laundry and storage. The 3rd smaller bedroom would be a perfect location to move the laundry so that you would have everything on one level. The exterior is good vinyl siding and asphalt shingles. There is a single detached garage that has ample room for parking your car plus space to also have a work shop. The yard is fenced with some trees and storage shed. There is plenty of off street parking with the extra long front drive. This home is priced to sell so give the listing Agent or Brokerage a call for further information or to arrange your personal viewing. 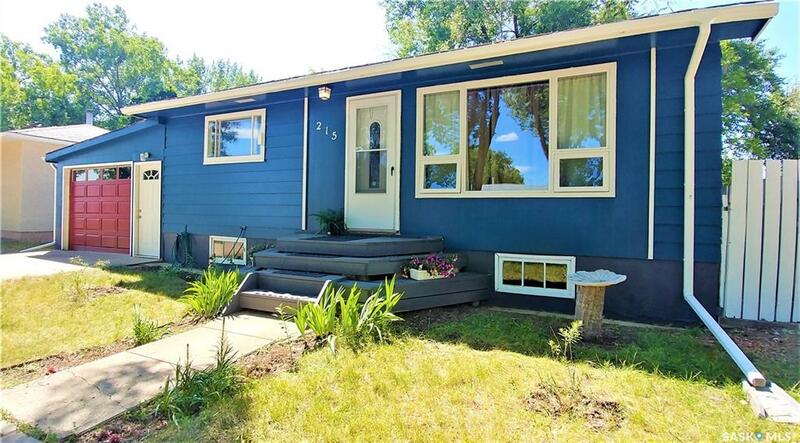 Take a look at this quaint bungalow located central to Maple Creek. 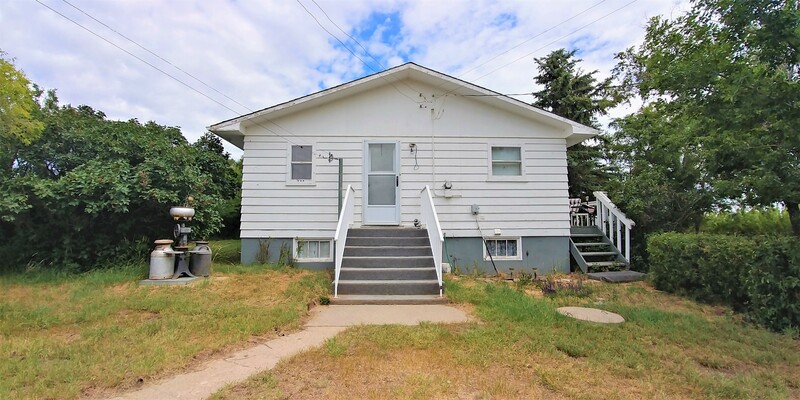 This 2 bedroom home would make a great starter or revenue property or it would make a nice, studio with the great natural light, or an Air-B&B for someone wanting to take advantage of a growing cottage industry given the proximity to the Cypress Hills Destination Area. The kitchen has wood cabinets, stack-able laundry and laminate floor. The cozy living room has access to the two bedrooms, all with laminate flooring. There is a 3 pc bath off the kitchen. The home has maintained much of the original wood trim around the windows and doors. Basement is only suitable for storage and mechanical. Exterior has vinyl siding and vinyl clad window trim. The yard has plenty of mature trees and privacy with plenty of room for adding on to the home or building a garage. Located well for schools and shopping. For further information or to arrange your personal viewing please contact the listing Agent or Brokerage. #110 Centre St. Fox Valley, SK. Located on a corner lot in the quiet community of Fox Valley, this is a perfect little a getaway cottage or small town retirement home. Located close to all the SW corner of Saskatchewan and SE corner of Alberta has to offer. The eat-in kitchen has good cabinets, lino flooring, and fridge and stove, the living room and two bedrooms have hard wood floors and much of the original wood finishing around the doors and windows. The interior of this home has received new paint & bathroom upgrades as well as the porch has full hook up for laundry and storage. The basement is mechanical with furnace (not in use as home is used only seasonally and gas has been disconnected), on-demand electric hot water and is connected to public water/sewer. 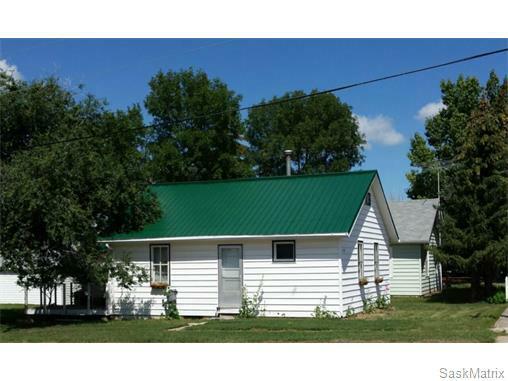 The exterior is updated vinyl siding and there is a good metal roof, small back deck and single detached garage. Seller would like to include furniture with the sale which includes; kitchen table, dishes, small appliances etc. beds, dressers, living furniture etc. Quick possession may be available; so there is not much to do but pack your bags and move in. A winter inspection would have to be without water on as the home has been winterized. For further information or to arrange to view this home, please contact the listing Realtor or Brokerage. #90 2nd Street, Fox Valley, SK. Located in Fox Valley, a village of about 350 people 45 min from Maple Creek. 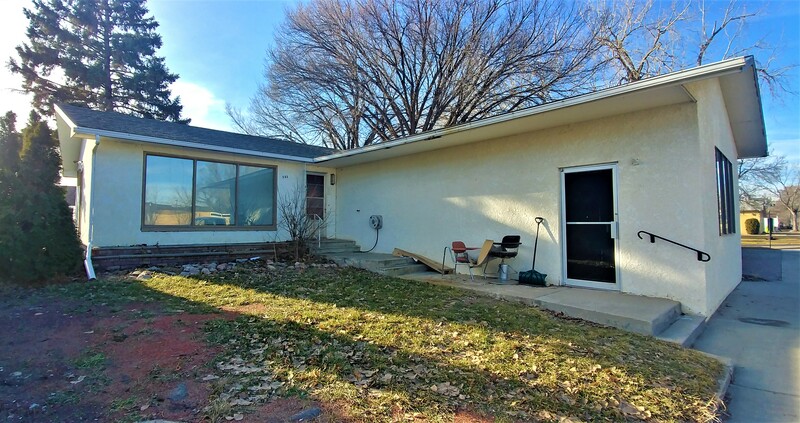 This 1 1/2 story 2 bedroom home has updated lino and laminate flooring through the main floor. The open concept main floor has good flow from kitchen/dining/living. There is a back porch with laundry off the main floor as well as the 4 pc bath off the kitchen. There is an atractive stain glass window in the stairway leading to the 2 bedroom 2nd floor. Both bedrooms are a good size. For further information or to arrange a viewing please contact the listing brokerage. #109 Walsh Street, Maple Creek, SK. #104 Lonsdale St. Maple Creek, Sk. 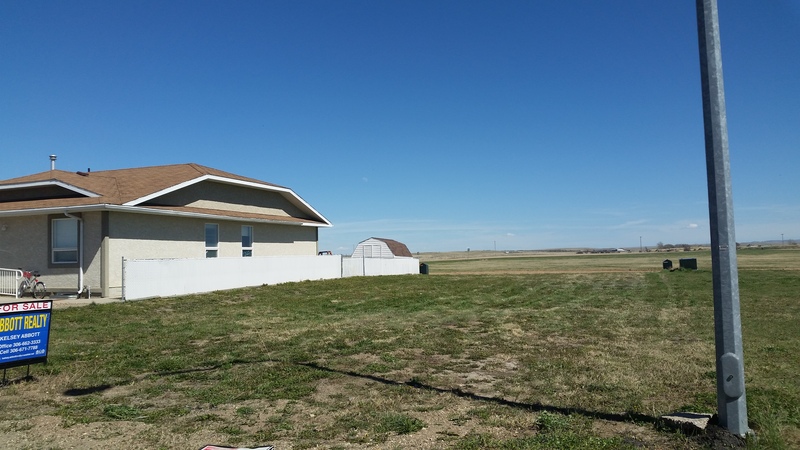 Dont miss out on the opportunity to build your dream home in the community of Maple Creek, a town of approx. 2500 people. Just 25 minutes from the Cypress Hills and 1 hour from Medicine Hat. This property is waiting for you to build or move something in. 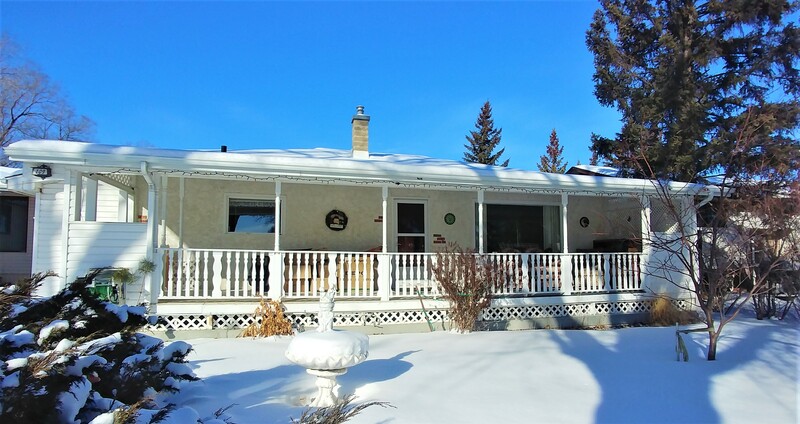 Located on the outskirt of town, this property has an uninterrupted view of the Hills to the south, as well as the picturesque Saskatchewan sunrise. For more information, please contact the listing realtor. #408 Maple Street. Maple Creek, Sk. #306 Aspen St. Maple Creek, Sk. This affordable 2 bedroom bungalow is located in the busy community of Maple Creek, 1 hr from Medicine Hat and 20 Min from the Cypress Hills. The eat in kitchen is located at the back of the house with access to the back yard and single detached garage. There are 2 bedrooms, good sized living room, a 4 pc bath as well as front porch completing the main floor. This home is suitable for revenue property, retiring couple, a single person or small family starter home. For further information or to arrange a personal viewing of this or any other listed home or for further information on the community contact the listing Brokerage or Realtor. #602 Herbert ST . Maple Creek, Sk. - SOLD! Located in Maple Creek, central to the Cypress Hills Destination Area & 1 hr from Medicine Hat. This home is on an extra-large corner lot close to recreation. Solid construction and many updates makes this a perfect home for single, senior or couple. There is an attractive front deck that provides wheel chair access through the front door. The kitchen has new cabinets and is open to the living room. There is room for a small table in the kitchen area, or a larger dining area could be easily accommodated at one end of the extra-long living room. There is only one bedroom at this time with the living room being extended, however it would be an easy fix to re-install the wall to return it to a 2 bedroom home. The 3 pc bath has been renovated to include a walk in shower. The back entry porch provides access to both up and down and has room for coats and boots, perhaps a freezer or moving the laundry up. The small basement area has laundry, 2 pc bath, storage and mechanical. The back porch also has an extra extension with sliding door providing extra weather protection. The exterior has updated windows, vinyl siding and metal roof. There is a single detached garage space that has been closed in to make a great heated work shop but if a buyer wanted to park in the garage, a new door could easily be but back in. This work shop also has an enclosed entryway making the heated garage/workshop more weatherproof. There is an asphalt driveway along the concrete sidewalk/drive plus a large carport with power and room for 2 cars end for end or covered storage. There is a fenced yard with an abundance of fruit trees and grassed area. The property also has 2 water wells. Dont wait to make this your home and be there to enjoy the beauty of this yard in the spring. For further information or to arrange a viewing of this home contact the listing Agent or Brokerage. #506 Walsh St. Maple Creek, SK. 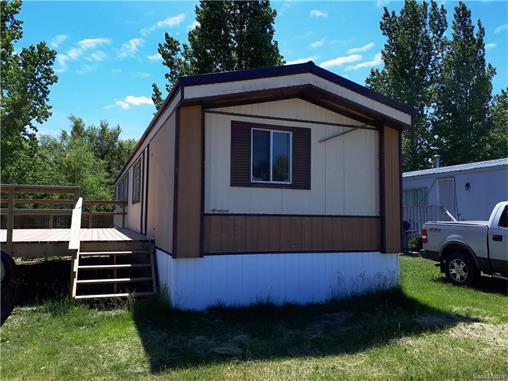 If you are looking for an affordable small acreage property this is a perfect property for you. 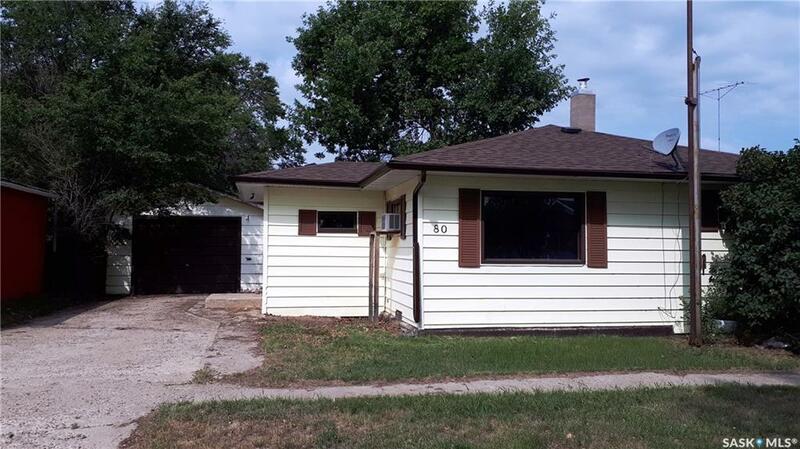 Located on the west edge of Golden Prairie this 3 bedroom bungalow features a nice size kitchen with ample cabinets, living room, 2 bedrooms and 4 pc bath on the main floor. The basement has another bedroom, den, rec room, laundry and plenty of storage. There are garden doors from the kitchen to the side deck, perfect for bbq or sitting enjoying the summer evenings. There is a small garage to provide a work shop or storage. The yard has some mature trees and plenty of room for you to further develop more buildings or yard space. For further information or to arrange a personal viewing contact the listing Agent or Brokerage..
#111 Aspen St. Maple Creek, SK. Priced to sell! 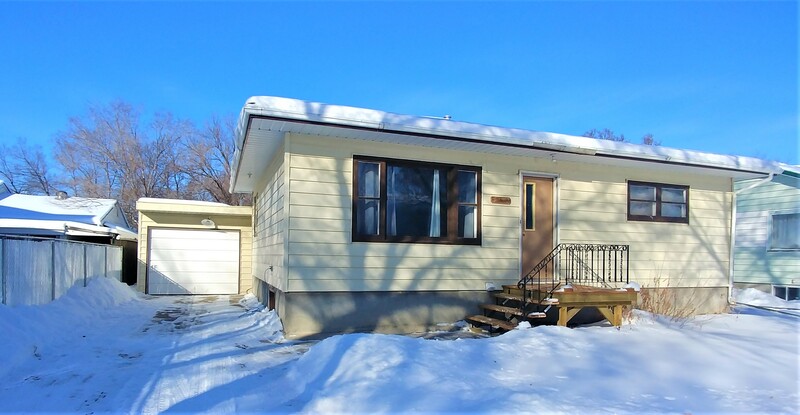 This 2 bedroom bungalow is a perfect starter home. The eat in kitchen has new flooring, built in dishwasher, and direct access to the back deck and large, well treed yard. The living room is good sized and has also received new flooring and paint. There are two spacious bedrooms both with updated laminate flooring. The 4 piece bath completes the main floor. Down stairs has laundry, mechanical and storage. The furnace and hot water tank have both been upgraded and a back water valve has been installed. There is a single 14 X 32 detached garage for addition storage, parking, or work shop area. For more information or to schedule a viewing of this home or any others in Maple Creek, please contact the listing brokerage. #407 5th Ave. Maple Creek, SK. Looking for an affordable home for the first time buyer or small family? 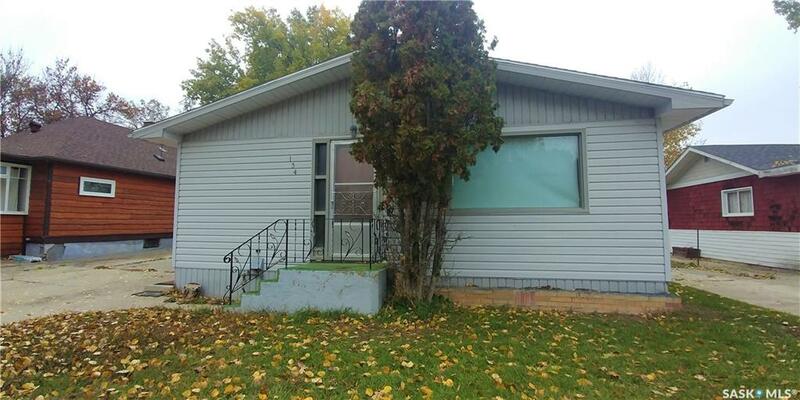 This 1 1/2 storey 3 bedroom home is located centrally within Maple Creek, on a large lot. The kitchen has ample cabinets, and garden doors that lead to the back deck and fenced yard. Enjoy the natural light in the large living room which has space for dining area plus a separate area for office/den and front entry. The 4 pc bath is and a good size laundry/porch with a door to the back yard. The second floor has 3 bedrooms, one larger and the other 2 suitable children’s rooms. Basement is storage and mechanical. 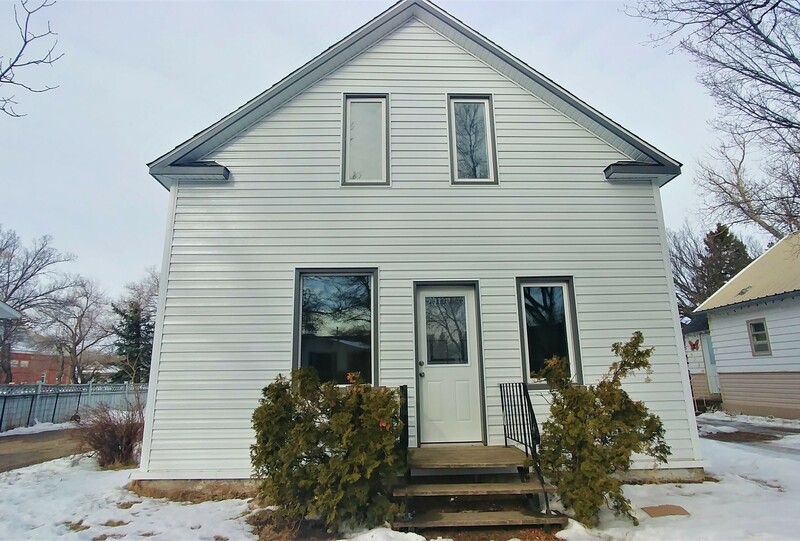 The home has updated vinyl windows and exterior doors, high efficiency furnace, central A/C, hot water tank and eaves troughs were all updated in 2009. Exterior is stucco for minimal maintenance. The back yard has good fence and plenty of room for kids to play. There is a nice size rear gravel drive providing plenty of room for off street parking or room to build a garage. Owner will provide one storage shed but is removing the other 2. Available for a quick possession. For further information or to arrange to view this or any other listed home contact the listing Agent or Brokerage. 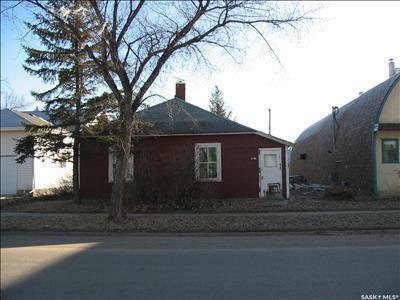 #446 Front Street, Eastend, Sk. Located on a well treed corner lot in the scenic town of Eastend. Take a look at this 3 bedroom character home. Built in 1919, much of the original charm of the home has remained. The original woodwork has not been painted and hard wood floors have been refinished. From the street you are greeted to friendly veranda, that leads to the living room & dining room. The kitchen has a country charm, and leads to the back porch and 4 pc bathroom. The main floor has a master bedroom, while the second floor has 2 bedrooms and den with plenty of built in shelving. The second floor has also had the hardwood floors refinished. Basement has “man cave” work shop, laundry and storage. Updated electrical and plumbing as well as new windows. Siding and shingles are in good condition. The yard has mature trees and shrubs, detached barn style garage with loft for extra storage and parking. For further information contact listing agent. Located in Maple Creek, this 2 story home is on an extra large [75′ X 130′] lot in a great central location to schools, recreation and shopping. Enter through the front entry into the main floor living/dining room, with high ceilings and bay window. The kitchen is a good size, has older cabinets and includes a new fridge, along with the stove and dishwasher. Through to the rear of the home there is a main floor den with built in cabinets, which could be used as a main floor bedroom. Across the hall there is a 3 pc bath (needs work) and a large laundry/porch back entry. The second floor has a large master bedroom created by removing a wall between 2 original bedrooms but keeping the second door should you wish to return the floor plan to have more bedrooms. The second bedroom is also a good size with great natural light. The large 2nd floor 3 pc bathroom has a new stand up shower. Sit end enjoy an evening in the 2nd floor sitting room/library, great location for the kids to hang out or create another bedroom. The back screen porch leads to the large back yard, that has a privacy hedge and fencing all around giving this home a lot of green space and privacy. There is an insulated single detached garage and 2 good storage sheds. 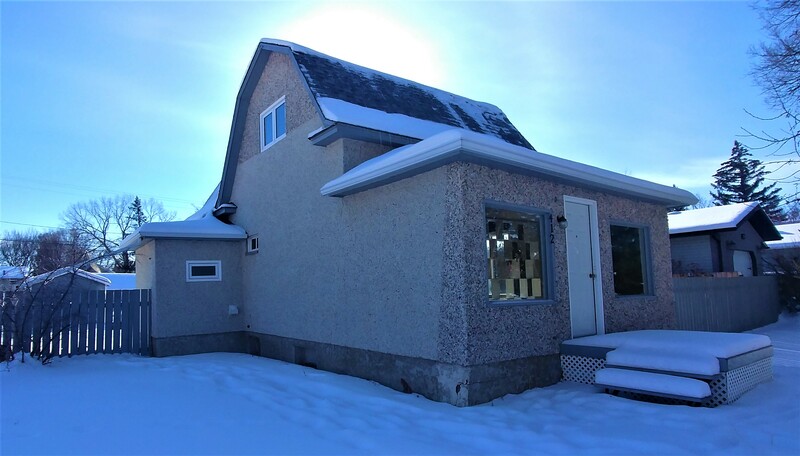 For further information or to arrange a personal viewing of this home or any other listed home in Maple Creek, give the listing Agent or Brokerage a call. Located between schools and recreation in Maple Creek and central to the Cypress Hills Destination Area, this 3 bedroom 1 3/4 story home has many updates. The kitchen has been updated (2007) with good cabinets/counter top with sliding/rolling drawers and shelves and pantry and linoleum. The Living room has updated vinyl plank flooring. There is a laundry utility room which is large enough to also use as office/play room. There is a 4pc bath completing the main floor. The second floor has a large master bedroom, and 2 smaller bedrooms, plus a storage/ reading nook or play area. Master and one other bedroom have updated vinyl flooring. Basement houses the mechanical and storage area. Recently the home has received all new windows and high end metal siding that mimics the style of siding original to the home. The yard is fenced and has shade trees and plenty of room to play or enjoy. The front drive leads to the older single detached garage. There is also room to park in the rear of the property. This home has been used for and works well for a home daycare. For more information or to arrange a viewing, please contact the listing Agent or Brokerage. Located central to the picturesque town of Eastent this tidy bungalow is a great buy. The eat in kitchen has ample cabinets large living room could accommodate a formal dining area plus living room area. There is a nice front foyer with closet. The 2 bedrooms both have good closet/storage. The living room and foyer have just received refinishing to the hardwood floors and the entire main floor has recently been freshened up with paint. There is a main floor bath and split entry completing the main floor. The basement has a good size rec room, bedroom, 3 pc bath, laundry and large storage mechanical room suitable to have a work shop. The exterior is in good condition. Back yard is fenced and is quite private. There is a single detached garage with front c/c drive for good off street parking. For further information or to arrange to view this home contact the listing Brokerage or Agent(s). #21 Highway N. RM. of Maple Creek, SK. 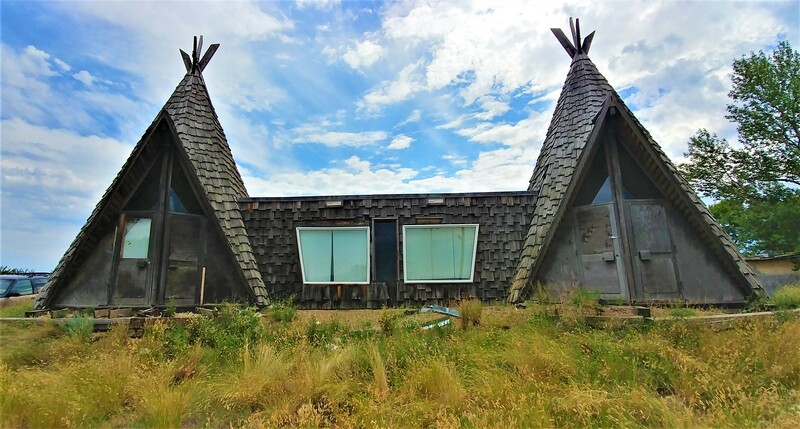 This unique property offers many possibilities. It is located 5 min north of Maple Creek at the corner of #1 & #21 hwy., 30 min from the Cypress Hills & the AB border. There are many exciting things happening in the Maple Creek & Cypress Hills Destination Area, and this property could be utilized as a number of different types of businesses or combined residential/commercial use. The Tepee style buildings were moved to the present location and placed on basement and additions were completed. The building still requires renovations but could offer residence in the back with sales in the front or utilize the building commercially and bring in or build a new residence. This location would make a great craft tourism sales location, food related sales, confectionery, coffee bar, many agriculture possibilities, and much more. There is power and gas to the property and an underground septic tank and cistern plus small water tank for fresh water hauling. Larger water requirement would need a larger cistern or drill a well. For further information or to arrange to view this property contact the listing Agent or Brokerage. This property offers a rare opportunity. 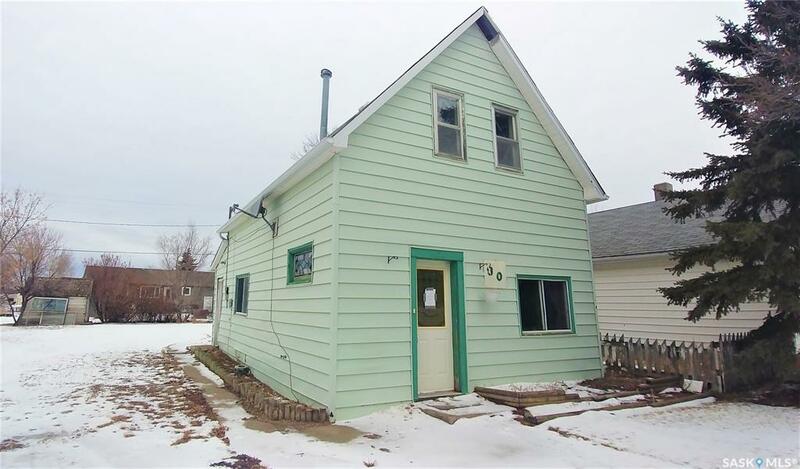 Located within the business district of Maple Creek this property has a 944 sq. 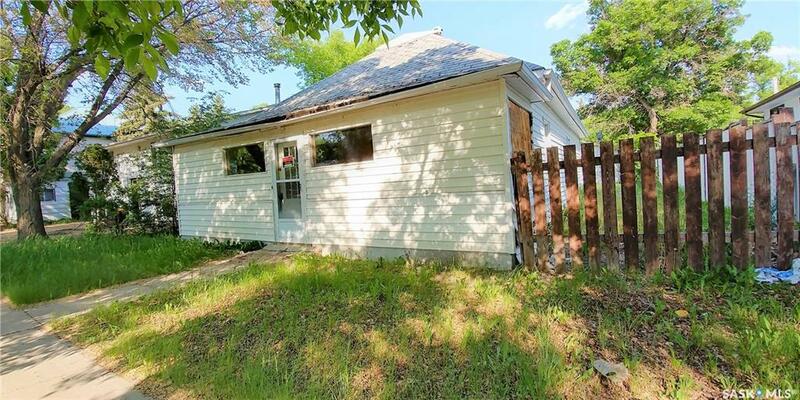 ft 2 bedroom bungalow with a full finished basement that could be owner occupied or rented either as residential or commercial space. Plus there is an additional 606 sq. ft. of commercial space in the front of the home that is presently rented to a hair salon. The home has recently received some updates to flooring and paint. The deck has preserved wood decking and stairs. The basement has a large rec room, 3 pc bath, laundry with good storage plus mechanical. There is a den area presently with hot tub (not in use) but could be utilized as a 3rd bedroom. The front commercial space has a large open area and 2 pc bath with additional storage or work area. Recently this area has new lino and paint. The roof on the house and front addition received shingles 2014. There is a 22 X 22 detached garage with a single door and recent garage door opener. This property has so much potential to be what you need it to be so do not wait, give us a call today. For further information or to arrange a personal viewing contact the listing Agent or Brokerage. Located in Maple Creek, central to the Cypress Hills Destination Area, 20 min from the park and 1 hr from Medicine Hat. This home is a perfect one level home with great features for seniors. The kitchen is a good size with a full line of appliances, well cared for wood base cabinets, new uppers and standing pantry as well as a great 4′ X 11′ walk in pantry. There is good natural light in the kitchen and ample table space. The living room is a good size and has access to the open front veranda which creates additional living space. The 4 pc bath has been upgraded with both a walk in tub as well as stand up shower. There is main floor laundry and small raised office area. There is a large master bedroom with door to the back deck and large w/i closet. Many of the windows have been upgraded. The basement is part finished with rough in 2 pc bath as well as room for further development. Furnace, hot water tank, sump pump, back water valve all completed 2010. Exterior is stucco and vinyl siding with shingles being replaced fall 2017. The fully fenced back yard is a nice oasis with many area’s to enjoy including a raised deck, ground level deck with storage sheds for easy storage of lawn furniture, green house as well as s a vegetable garden space, There is a large single door garage with work shop and carport in the rear as well as plenty of parking including a paved back drive. For further information or to arrange a viewing of this home or any other please contact the listing Agent or Brokerage. Take a look at the fresh updates to this home. 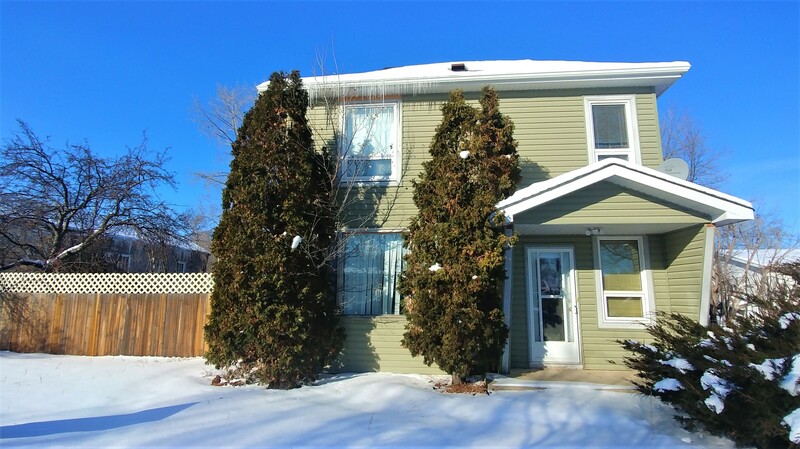 Located in the popular community of Maple Creek, central to the Cypress Hills Destination Area, and close to schools and shopping. Over the past number of years there have been ongoing updates. The open kitchen/dining living space has updated paint and flooring, with good cabinets, stainless and black fridge and stove. The front door and living room window are new 2017/18. The 2 main floor bedrooms are a good size and have updated flooring and neutral paint. There is a large 4 pc. bath with a window providing natural light. The side entry also has the door to the basement. The basement has new cement poured 2017 with rough in for bathroom. The basement has laundry and is an easy finish for a buyer to develop to suite their needs.. The attached front drive garage with c/c driveway also has a new front passage door. There is a fenced back yard with mature trees and older storage shed. This spring the house has received a fresh coat of paint and new eaves trough. It is available for quick possession. 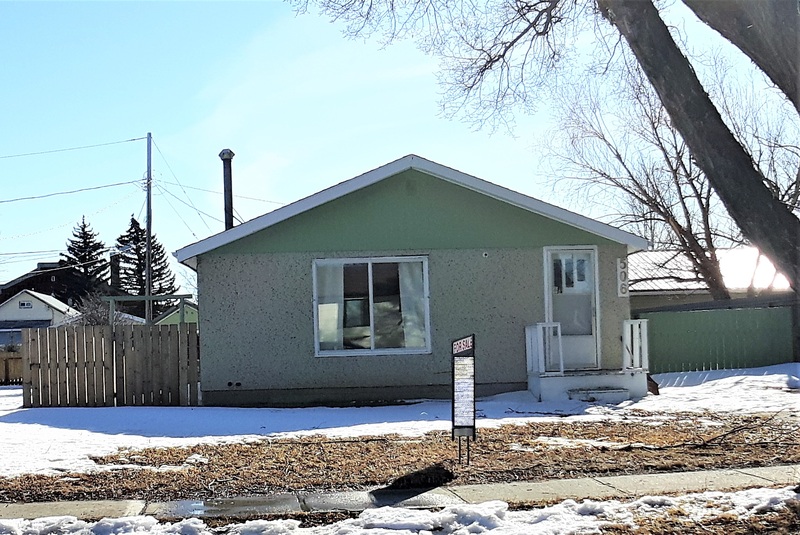 For further information or to arrange a personal viewing of this home or any other listed home in Maple Creek, give the listing Agent or Brokerage a call.